Running With Horses: The Results Are In! 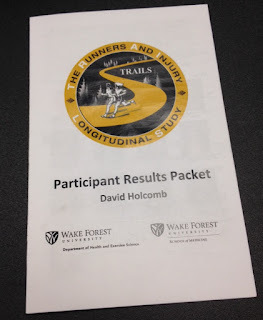 After almost 4 years of data collection, observation, poking and prodding, the TRAILS study at Wake Forest came to a phase one conclusion this past week. Participants met to review the individual and group results at the new Fleet Feet store on Stratford Road (which, by the way, is super nice and perfect for this sort of meeting with their dedicated training area). As a reminder, I was one of 300 runners who took part in this study, commissioned by the U.S. Army, with the objective of better understanding and preventing overuse injuries. The only stipulations were that you committed to running an average of 10 miles / week and that you reported this mileage, along with responses to a series of survey questions, on a regular basis. I was also asked to come in four times for a series of measurements, exercises, and running diagnostic activities. The results were interesting, to say the least, but not surprising. In fact, I rarely pull the "I told you so" card, but .... what appears to be the most direct correlation to injuries, is exactly what I thought it might be (explained below). And in areas of biomechanics that I already knew I wasn't the model runner, it is even worse than I thought (again, more below). So, what did the runners, Wake Forest, and the Army learn from this study? * Of the 300 runners, 196 became injured! 65% - Whoa. Now, before you start back with your own "I told you so," keep in mind that "injury" also included discomfort that did not result in having to miss a run. So I actually see this as 104 runners who ran relatively pain-free for several years - that's pretty good. * Out of the 196 "injured runners", 51% did require having to stop running for more than 2 days (100 runners, or 30% of total group). And of these runners, 55% of them experienced the same injury on multiple occasions. * Runners averaged between 1 mile / week (recall injured runners may have had '0' weeks) and over 30 on the high end. The average pace was in the mid-9:00 range. * The average pre-run stretching time was 8 minutes. * 20% of participants ran in Brooks, 20% in Asics, and then down to 13% for Nike, Mizuno, and New Balance. * The most common injury was "knee pain." An interesting comment was made in regards to weight management, shoe selection, and running form, as they relate to knee pain. 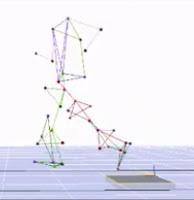 In short, the force to ground for the trial runners was 2.26 X body weight on each foot strike. However, the load on the knee joints was an average of 9.64 x body weight! No wonder our knees thank us when we lose just a few pounds. Click on to enlarge: Looks like I step lighter, but load on knee is greater and pronation is extreme! * High arches are a bigger problem than flat feet or low arches - contrary to what we always heard about running flat-footed. * Not part of the study, but when discussing BMI results, it was noted that BMI in everyone increases at the age of 60. In everyone, except for regular runners who actually maintain their pre-60 BMI well past the age of 60! LEG STRENGTH! (Although I was secretly pulling for the doughnut-a-day theory). Of course, there are many variables that play into injuries, so don't disregard these others, but the research showed the most significant statistical correlation between runners who remained injury-free and those that did not, was that of leg strength. I have personally always considered that to be my good fortune as a runner, I just didn't have the science behind it. It seems that the leg muscles--calves, hamstrings, and especially quads--do more to offset the impact of force on the knees than anything else. In a way, "duh! ", but in a way, I don't exactly see most recreational runners working the leg lift machine at the gym. 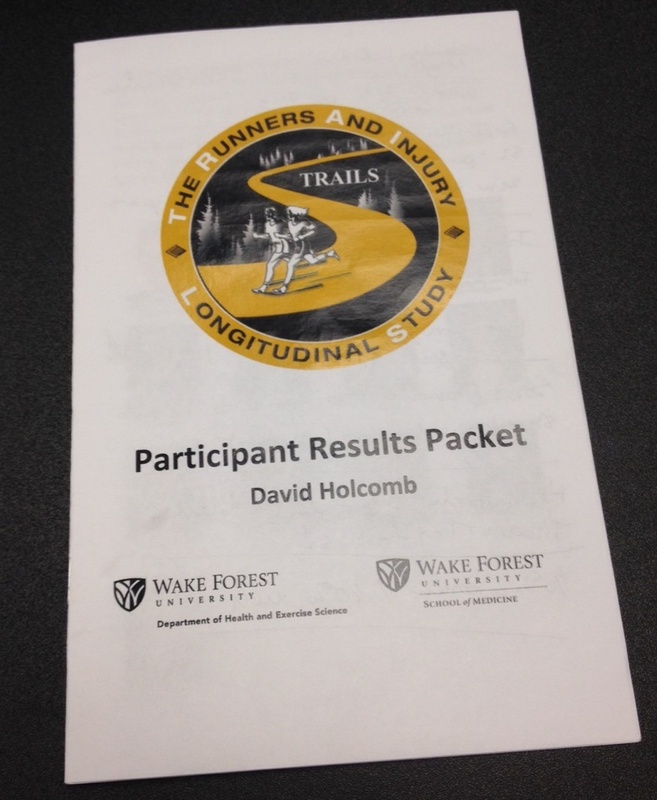 Anyway, the packet of information was 12 pages of really great running geek data, and the session was a lot of fun. I'm hopeful to participate in future studies as well. Until then, let's keep working those legs and building up those quads. And here's to many more injury-free miles.